Over the past 10 (and for some of you, 15) years, you’ve seen the Internet become a functioning part of your marketing arsenal. The question at conferences is no longer “do you have a website?” but “what generation IS your website?” Now people are telling you that social marketing and Twitter are the hip new things and you’d better get on board before you’re left far behind. Am I too late to get started with this? Do I have to hire more people to do this, too? What can little snippets of conversation really do for my company? I only have so much time in a day, so how will I find time for this? Show me someone that has made money using this technology. Well, these are all valid questions, comments and concerns. 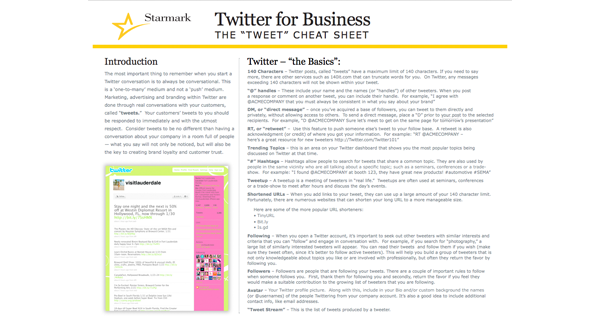 Therefore, we’ve assembled a Twitter for Business – The “TWEET” Cheat Sheet to help you start, or in some cases, enhance your thinking about using Twitter. And while this document won’t answer all there is to know about tweeting for business, it will be a valuable resource for anyone using social media to build their business. This downloadable document we’ll give you the basics on Twitter, some brief strategies and best practices for your company. Remember, first and foremost, that Twitter is about naturally engaging and connecting with your customer and industry base. It’s a conversation. It will take time to build, just as any network does, but you will come to find that with over 75 million users (number of accounts by year end 2009), Twitter is a powerful medium that deserves your attention. This is one of a series of useful Cheat Sheets on Social Marketing (see our Social Bookmarking & Sharing Cheat Sheet).